LM Services are committed to providing superior quality products, a terrific service and the best installation for your home, combined with excellent value for money. LM Services are one of the UK's leading installer of Dry Verge Capping working across the UK we combine quick, efficient service with long term product guarantees. LM Services take great pride in the work we do and always aim to achieve the highest possible quality standards and customer satisfaction levels. Quality home improvements supplied and fitted roof guard, upvc guttering, fascias, barge boards and soffits to our house on the 8th and 9th of January 2013. We are very pleased with the quality and care of the work carried out, and the end result. Offering only the finest Home improvements, we are dedicated to making your homes dreams a reality. With Quality Home Improvements UK your design possibilities are virtually limitless and our expert team are here to help you every step of the way. 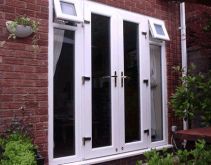 Whether your project is large or small Quality Home Improvements UK are delighted to offer their services to ensure your home is of the highest quality. "A neat and professional job that's transformed the appearance of my house." "A fantastic job, great value for money and completed quickly and exactly as requested." "we were never asked for any money until the job had been completely finished and all of the rubbish had been removed." "It makes such a pleasant change for a company to actually do what they say they are going to do, without any fuss or agravation, brilliant!"